Has your science center sat unchanged for too long? Bring the outside – IN! 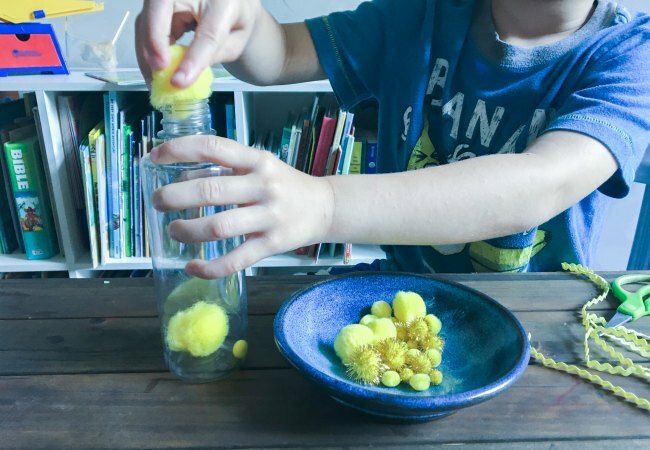 Make and set these fun summer sensory bottles to reignite children’s interest in science. 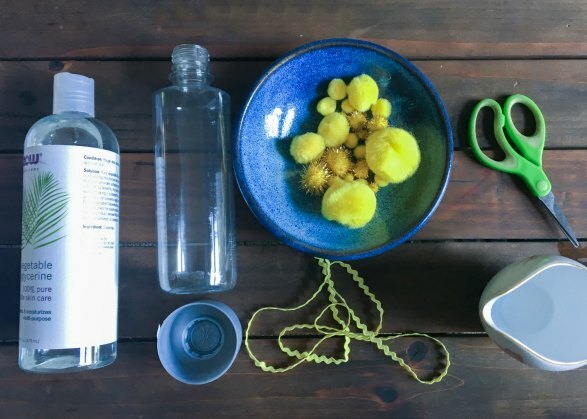 Read on for how to make and use each bottle. 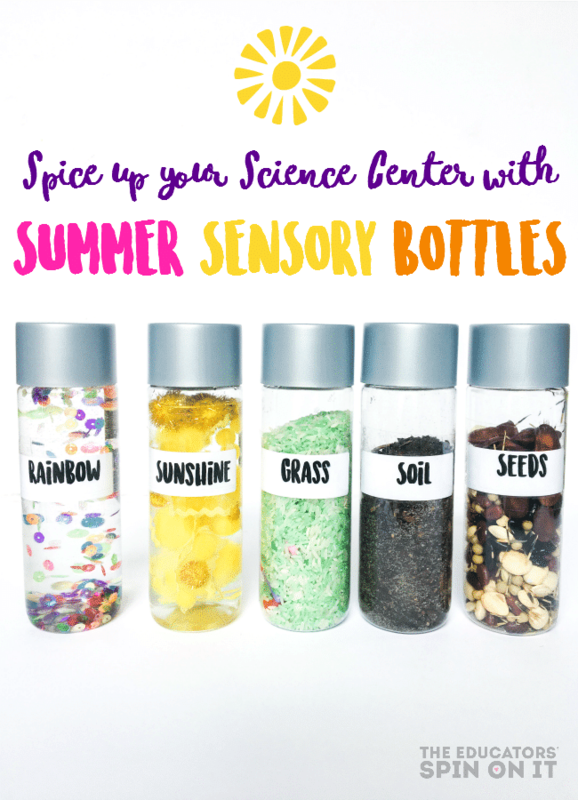 Taking some of their words, we gathered materials and made a set of summer sensory bottles for our science center. Address label or masking tape. Material note: We researched water bottles and prices. The Voss water bottles work fabulous with little hands because they are easy to see inside, have easily removed stickers, and chunky caps. For the best price, we purchased a case of Voss water bottles from Amazon Prime and had them shipped to our door free. First, add several pinches of colored sequins. Then, pour in water until the bottle is half full. Add in some glycerin or baby oil. This will change the density of the mixture. Put the cap on and shake to mix. If all of the sequins float to the top, add more water. If all the sequins sink, add more glycerin or baby oil. Continue adding until the container is 7/8ths full. The goal is to get the sequins so they “float” inside the liquid for a moment when the bottle has been shaken. When the bottle has been filled, hot glue the lid on. Make and tape a label on the bottle. We have used address labels and colored masking tape. 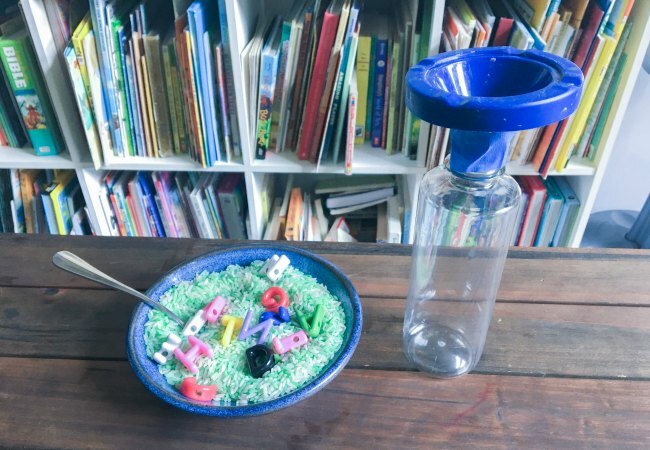 Material Note: Bird seed is the least expensive “seed” option to fill this sensory bottle with. Many bird seeds, however, do contain nuts. We went to our local feed store to purchase seeds in bulk. Lima bean, green bean, squash seeds, and peas are all great seed varieties that vary in shape, but are still larger in size. 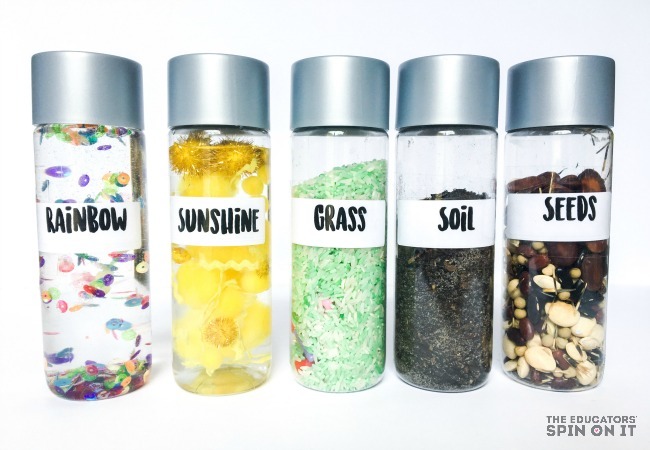 Carrot seeds are great to compare – but you would need a LOT of carrot seeds to fill a seed themed summer sensory bottle, as they are very tiny! 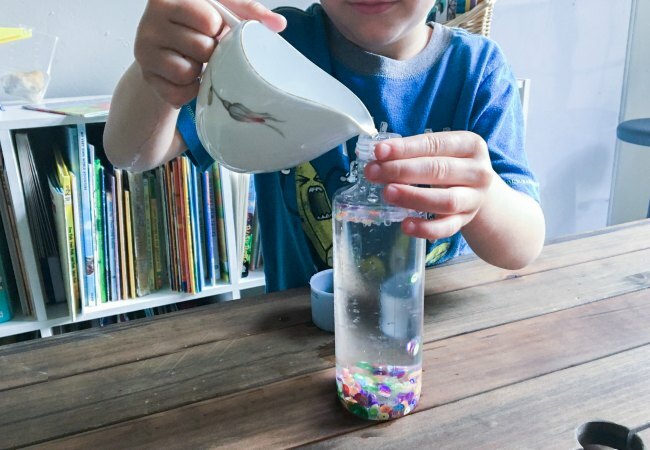 Directions to make the seed themed summer sensory bottles. First, make sure the bottle has no moisture on the inside. Any moisture will cause the seeds to begin molding. 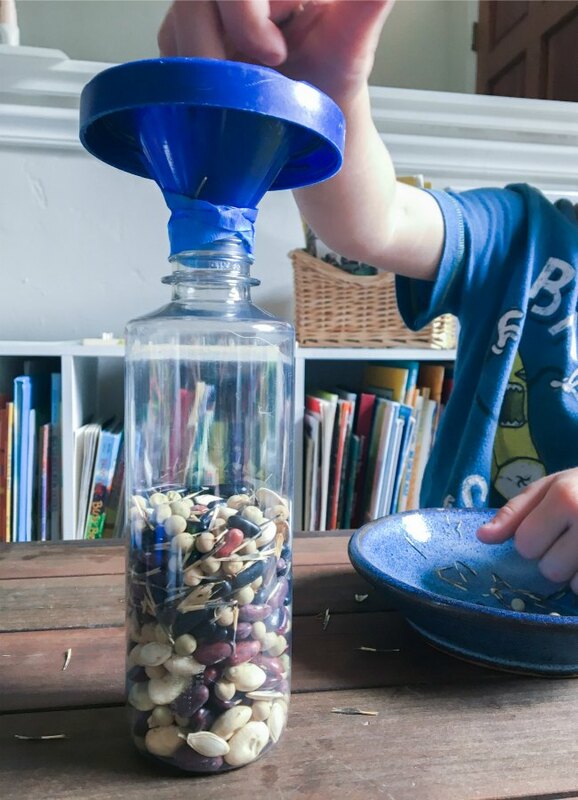 Set the funnel over the opening and let the child fill the bottle with seeds. When it is ¾ full, hot glue the cap securely in place. Hot glue the lid on. Make and tape a label on the bottle. We have used address labels and colored masking tape. Mix the bottle. Observe and discuss. Material note: Cutting the rick-rack into smaller pieces for the sun rays is tough and an adult only job. Substitute yellow yarn in to make it easier to cut. Directions to make the sunshine themed summer sensory bottles. 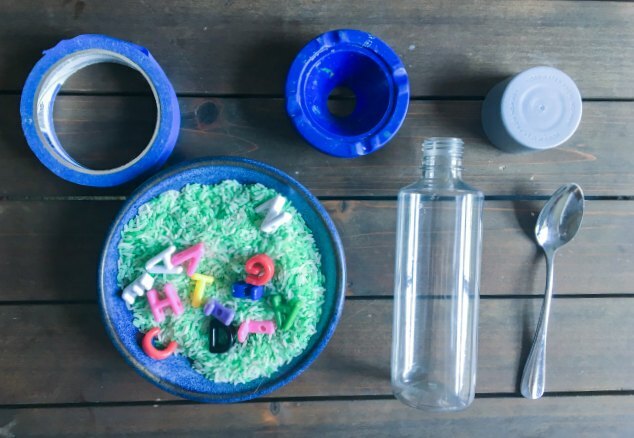 First, fill the empty bottle with pom-poms and rick-rack pieces. Then fill in a little over halfway with water. Add in glycerin or baby oil until the bottle is 7/8th full. When the bottle has been filled, hot glue the lid on. Make and tape a label on the bottle. We have used address labels and colored masking tape. Uncap the empty bottle and fill it with soil from the garden. Secure the cap with hot glue. Yes – that’s it. 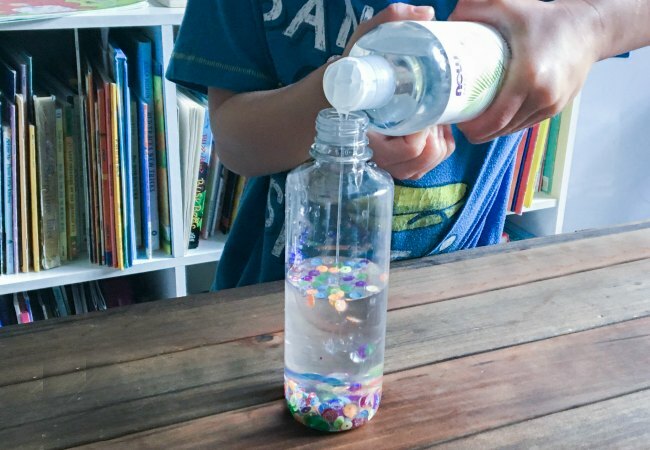 This sensory bottle is super easy to make. But very eye opening as the garden soil may have sand, soil, bits of leaves, sticks, clay or other items within it. 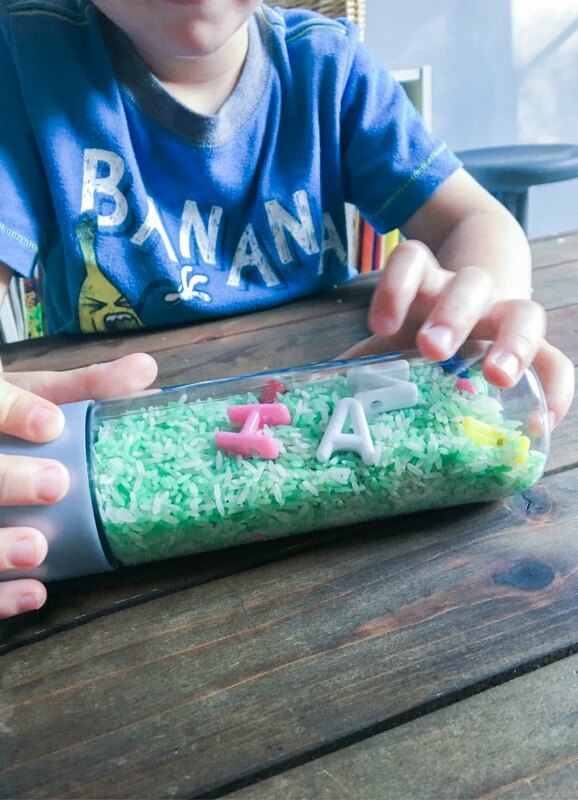 Directions to make the grass themed summer sensory bottle. First, make sure the bottle has no moisture on the inside. Any moisture will cause the rice to begin molding. 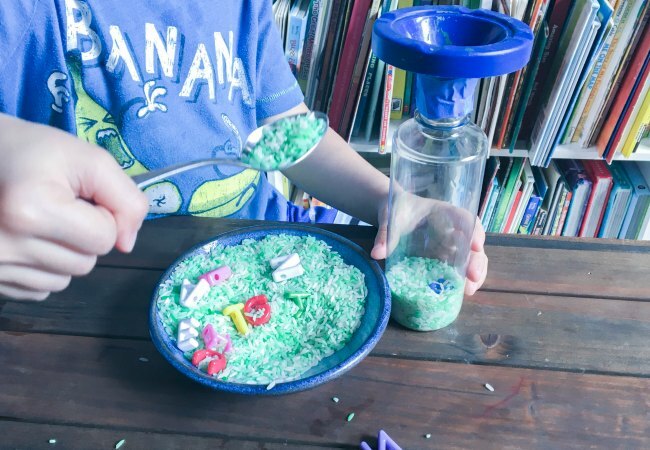 Set the funnel over the opening and let the child fill the bottle with rice and letter beads. As the child spoons the letters, say the letter name and the sound it makes. If you are worried about making a mess, do this step over a large shallow Tupperware container. Even setting a table cloth or sheet under the child’s work area makes clean up a bit easier. When it is ¾ full, hot glue the cap securely in place. Hot glue the lid on. Make and tape a label on the bottle. We have used address labels and colored masking tape. Then, let the child roll and read the letter names and sounds. For a challenge, have them think of a word that begins with the letter sound that they just found hiding in the grass. Any type of clear bottle with a lid that seals would work like Recycled soda bottles or tall plastic containers. These look great! What size voss bottles have you used please? Inspired to make some for my foundation class when we return in September.